Our solar system within the Milky Way galaxy consists of eight planets and one dwarf planet, Pluto. The distance between each planet and the sun varies; however, it’s possible to calculate the distance between two planets by subtracting one planet's distance from the sun from the next planet’s distance from the sun. For example, to calculate Jupiter's distance from Mars, you can subtract Mars' distance from the sun from Jupiter's distance from the sun. Mercury is the closest planet to the sun, at an average distance of 36 million miles. Venus is next in line, at 67.1 million miles. Subtracting 36 from 67.1 equals 31.1, meaning that the distance between Mercury and Venus is 31.1 million miles. Earth is 92.9 million miles from the sun. Subtracting Venus's distance from the sun equals 25.8, meaning that Venus and Earth are 25.8 million miles apart, on average. Mars is 141.5 million miles from the sun. 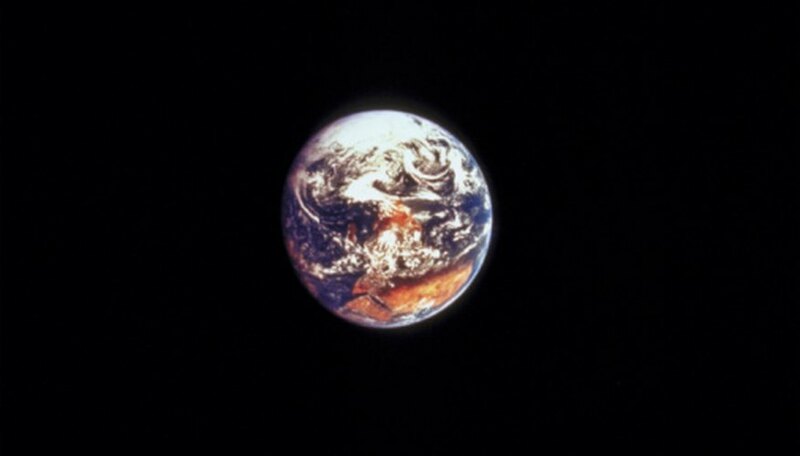 Subtracting Earth's distance equals 48.6, meaning that Mars and Earth are nearly 50 million miles apart. 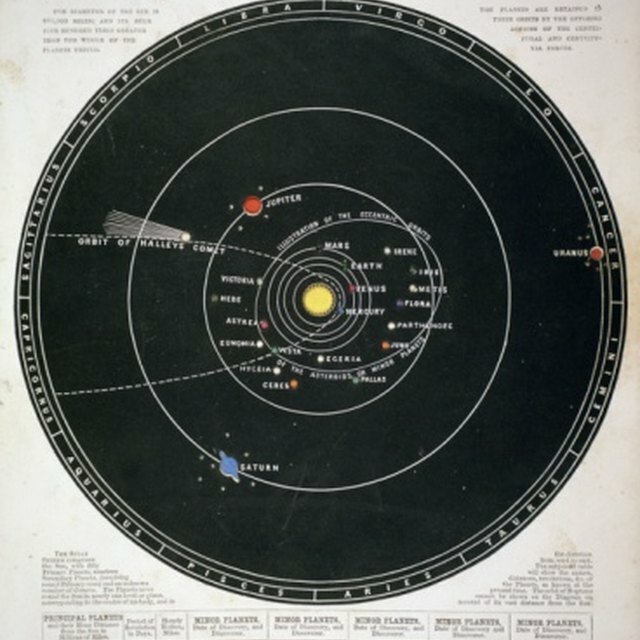 Mercury, Venus, Earth, and Mars comprise the inner planets of the solar system. The large gap between Mars and Jupiter is where the outer solar system begins. Jupiter is 483.4 million miles from the sun, which means that it's 341.9 million miles from Mars, its closest neighbor. Next in line is Saturn, with its average distance of 886.7 million miles from the sun. This means that Jupiter and Saturn are 403.3 million miles apart. The distance between Saturn and Uranus is greater than the distance between Saturn and the sun. Uranus is 1,782.7 million miles from the sun, so the distance between Uranus and Saturn is 896 million miles. The gap between Uranus and the final planet, Neptune, is even larger. Neptune is 2,794.3 million miles from the sun, and 1,011.6 million miles from Saturn. Pluto was once considered to be the ninth planet. Today, astronomers have reclassified Pluto as a "dwarf planet”; it’s too small to be considered a planet, but maintains a planetary orbit and has its own satellite. Its average distance from the sun is 3,666.1 million miles, meaning that the distance between Pluto and Neptune is 871.8 million miles. It’s worth noting, however, that every 248 years, Pluto's erratic orbit causes it to move inside the orbit of Neptune, where it stays for about 20 years. During this time, Pluto is actually closer to the sun than Neptune. Jordan Bruns has been writing since 1998. His most recent position was as a columnist for the movie section of 411Mania.com. Prior to that, he was a volunteer movie critic for the "Palladium Item" in Richmond, Indiana. Bruns has a Bachelor of Arts in communications from Indiana University. What is Earth's Position in the Solar System? What Is the Distance From Neptune to the Sun? Bruns, Jordan. "Distances Between the Planets in the Milky Way." Sciencing, https://sciencing.com/distances-between-planets-milky-way-8664598.html. 24 April 2017.